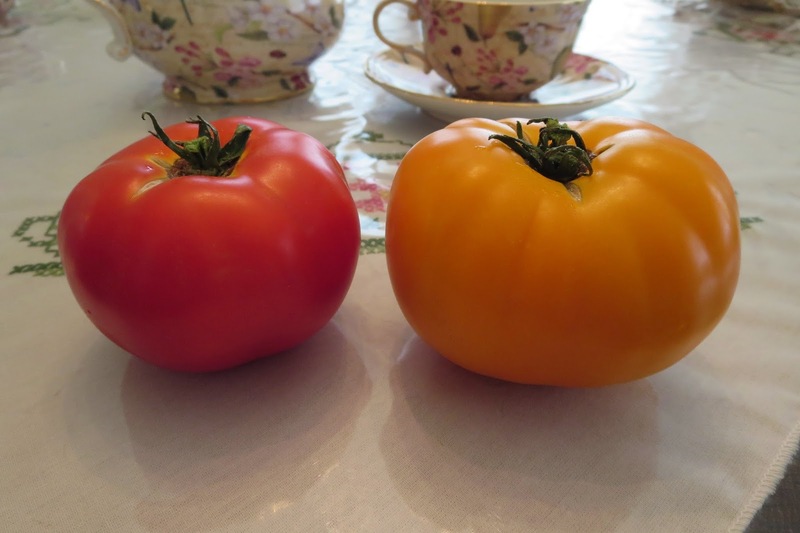 My friends, may I present you TomatoMountain Merit F1 2014 AAS Regional (Heartland) Vegetable Award Winner on the left and the Tomato Chef’s Choice Orange F1 2014 AAS National champion Vegetable Award Winneron the right. For vegetables, many trial grounds, like Johnny’s Selected Seeds and many US state universities, exist across Canada and the USA. Many display gardens exist across North America. In Maryland, we have the Brookside Gardens (flowers) in Wheaton, the US Botanic Garden (flowers and vegetables) in DC and the Cylburn Arboretum (flowers and vegetables) in Baltimore. 2 Mountain Merit plants on the right, Chef’s Choice Orange plant on the left end of July. 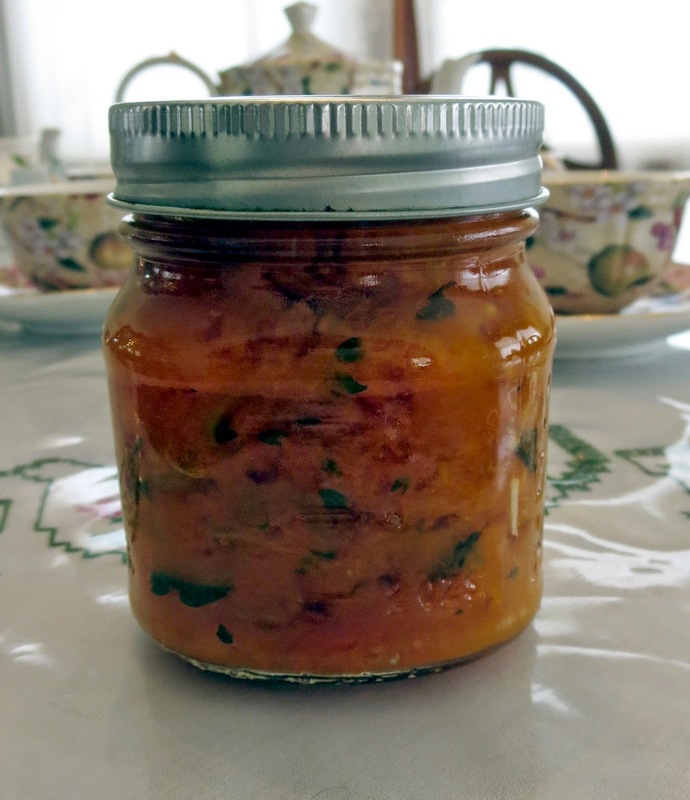 The Mountain Merit is used sliced in your sandwich or diced to make bruschetta. Being a determinate variety, the yield is spread over one month and the height reaches only 4 feet. The Chef’s Choice Orange is to use in cooking or to make salsa. A member of the Beefsteak variety, our plant reached the 8 foot mark upright by August. Both need solid tomato cages. The branches are very sturdy and heavy in fruits and can be supported with twine. 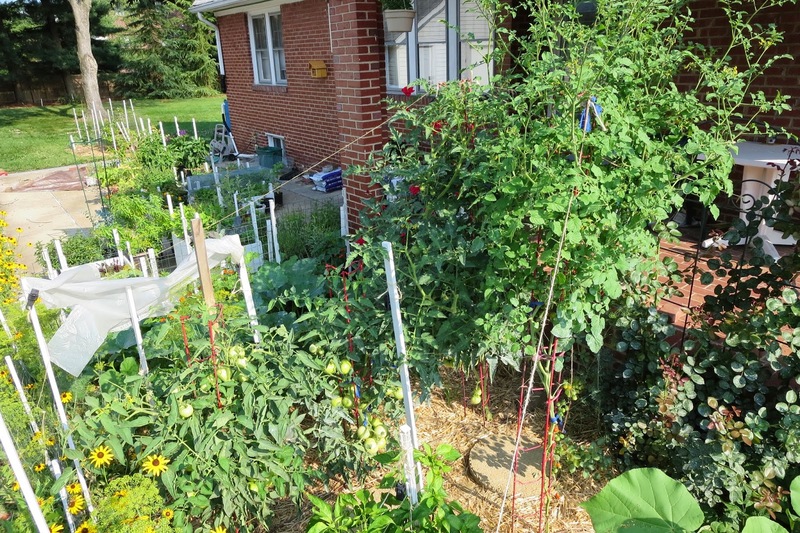 We have to brace our triangular tomato ladder pole on the Chef’s Choice Orange plant. On the early blight disease side, both show in the garden good resistance with our watering schedule and a minimum spray fungicide program. With the use of a high tunnel for 3 weeks in May, both varieties gave harvest spot on at 75 days. I must say, my wife and I are pleased with the results. I know that according to our picture, our Chef’s Choice Orange tomato looks more yellow-gold than orange. Don’t worry – once cooked, the sauce is orange. I'm also growing Chef's choice this year and have been very satisfied with it's performance. Like most orange/yellow tomatoes, it is low acid. It has good taste, but is not as tasty on a BLT as a Brandywine (Sudduth's strain).